The manuscripts will be displayed in Rauner during this week’s Islam Awareness Week, Arshad said. 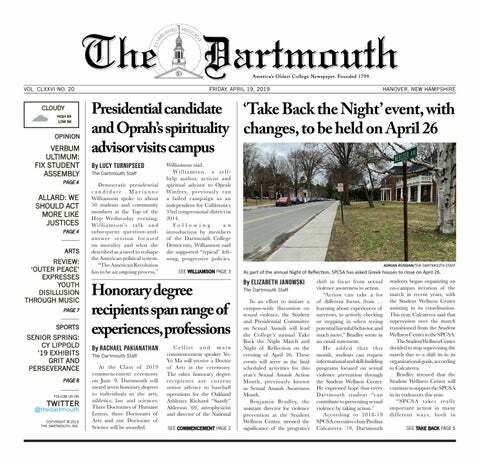 This is Dartmouth’s first Islam Awareness Week in five years, Al-Nur president Iman Hammad ’17 said. Members of Al-Nur felt that in light of current events, it was an appropriate time to hold Islam Awareness Week once again. The awareness events started April 5 with a display in thesouth end of Baker-Berry Library. Hammad said that the library display includes space for students to answer questions such as “What do you think when you hear the word Islam?” and to name famous Muslim-Americans. She said that the group began planning for the week’s events last fall. Arshad said that the group felt the need to hold these events due to recent negative media coverage of Islam. In addition, he noted the importance of the events in the context of the recent murder of three Muslim students near the University of North Carolina at Chapel Hill campus and additional unreported hate crimes. He noted that the mainstream media presents “an unfortunate clash of civilization narratives” that causes problems. Arshad said he hopes in the smaller sphere of Dartmouth, Al-Nur can engage with mainstream campus to address some of these issues. Hammad noted that the week’s events would hopefully demonstrate to students and community members the presence of Muslim students on campus as well as a willingness to engage on a range of issues. Ali Siddiqui ’17, Al-Nur treasurer, said that students seem interested in learning more about Islam due to responses from some 250 students collected in a survey. Siddiqui said that the group released the survey as part of the application for Special Programming and Events Committee (SPEC) funding. The survey asked students to rank how educated they believe students are about Islam and the importance of that education, he said. Hammad said she hopes the group’s efforts will increase awareness of what Muslims, in particular Muslim-Americans, are like and how they follow their faith. “The majority of Muslims should be viewed as people who have a rich history of art, culture, theater and everything that is the opposite of what we always hear about now,” Hammad said. Siddiqui said he hopes students will come to these events with an open mind and leave with even more questions and curiosity. The keynote talk today by Joseph Lumbard, a professor of classical Islam at Brandeis University, will offer an academic perspective on Islam, Hammad said. Arshad said that the talk, titled “Islam: A Religion of Restraint, Mercy and Love,” will present students with a different take on Islam in America. He noted that Lumbard is an American convert to Islam who has become a leader in the Muslim-American community as well as a leading scholar of Islam. The second Thursday event, held at Collis Student Center and titled “We’ve Got You Covered: Modesty in Islam,” will give students the opportunity to try on a hijab — a Muslim headscarf — and offer their reflections on the experience. Hammad said that this particular event was inspired by a similar program at Brown University for World Hijab Day. Hammad began to wear a hijab this year, which she said focused herself within Islam. Other people can erroneously see the scarf as a sign of oppression, but Hammad said that in reality most women choose to wear the scarf of their own volition. Hammad said she is excited to see how other’s react to trying on the hijab, as she herself finds it to be a “safe, warm, toasty” experience. Tomorrow there will be a Jummah prayer and discussion at 1 p.m. in Rollins Chapel, and on Saturday at 4 p.m. there will be an Islamic art and calligraphy lesson in Thornton Hall. The week’s events will culminate with the staging of Rohina Malik’s one-woman play “Unveiled” that focuses on the experiences of Muslim women in a post-9/11 world. Sharjeel Syed ’16, Al-Nur secretary, said he is excited to see how Malik tackles controversial issues surrounding the image of Islam and the 21st-century experience of Muslim-Americans. Hearing different perspectives on Islam is important on campus, Syed said, because Dartmouth students will have influence in the fields they choose to pursue.